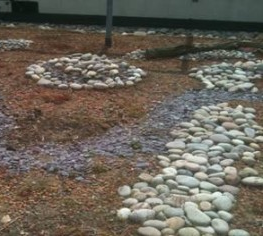 We revisited the London School of Economics, scene of our central London biodiversity roof installation in October 2009. The aim of the project was to create stepping stones for wildlife within the London area to increase the boundaries for nature to thrive, and help to reduce the impact of urban development in the city on nature. Much to our delight the roof had become inhabited by a family of great black backed gulls. Proof biodiversity roofs really do work!